You'll know when you're famous when you get a giant-sized billboard like this in New York's notorious Times Square. By the looks of things, everyone wants of piece of Lady Gaga's new scent 'Fame', even if they are scantily-clad miniature muscle-bound fame monsters. This dark fetish-inspired ad is for the pop star's first ever black eau de parfum and is sure to sell by the bucket, or bottle, load. 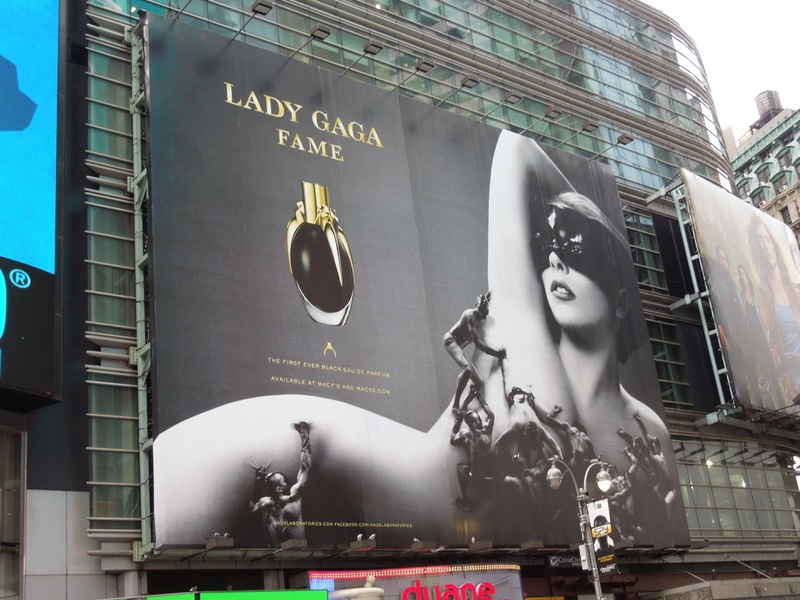 This revealing super-sized billboard was snapped in Manhattan's Times Square on August 27, 2012. Even though it has a futuristic feel, and accompanying sci-fi fantasy TV commercial, there's also something terribly 90's about this black and white ad, in Daily Billboard's opinion it's like a mash-up of Erotica, Human Nature and several other Madonna music videos. If you're a fan of The Fame Monster, be sure to check out these other Lady Gaga billboards from around L.A. and for other celebrity fragrances, take a look at Rihanna's Reb'l Fleur and Rebelle perfume billboards.